Bhagavan Sri Ramana Maharshi says that everyone is the Self by one’s own experience. This book endeavours to bring about truth. He has a unique way of pointing to the extraordinary in the ordinary. For example he points to the happiness which we experience in deep sleep state and says that it is our own intimate and inherent nature because we remainas the self as pure consciousness in deep sleep. He uses our own day to day experiences in the three states of existence to enable us to understand and experience our real nature which is consciousness bliss. His answer direct the attention of the devotee to his won I in a way that he has never looked at before. Devotee: The world tells me its existence now. Even if I deny its existence I may knock myself against a stone and hurt my foot. The injury proves the existence of the stone and so of the world. Maharshi: Quite so. The stone hurt the foot. Does the foot say that three is the stone? D: No. “I”. M: Who is this I? it cannot be the body or the mind as we have seen before. This “I” is the one who experiences the waking dream and sleep states. The three states are changes which do not affect the individual. When Sri Ramamohan suggested that I should write a few lines about this invaluable book, I felt why any distraction like this? The reader / Seeker should straight plunge into it catch the pointer and move in the directions so effectively and precisely provided. But then the gentle persuasion of the author was disarming and I yielded. There are many feature which make this volume singularly pragmatic. Sri Ramamohan has evidently traversed the path he has paved for himself and now graciously and joyfully shares with us. The attempts at choosing pointers carefully oriented to the quest for happiness culminating in action work doershop is quite a daunting job. It involves absorption of qualities which mark Bhagavan teachning pointer which quite often lie in between Bhagavan profound silence. Above all the pointers chosen should refresh the seasoned seeker and the same time rouse the curiosity of the beginner eager to learn but a bit unnerved by the quantum of literature available by and on Bhagavan. This is effectively achieved by Sri Ramamohan introductions and passages chosen from Bhagavan. In the origins of this attempt lie not mere cerebral reflections but authentic experiences. In a candid remarkable revelatory account the author tells us about the grace and guidance of Bhagavan which he experienced in the course of his practice. He says: in few months the practice resulted in a three and their hour thought free state in which there was perfect awareness without even a single thought. This was long and continuous spite of understandable and needed breaks in between. It was quintessentially a state of perfect awareness and utter peace. It is one believes from this fount of energetic peace that this precious volume emerged. Ken Wilber regarded as the Einstein of Consciousness Studies in his introduction to the American edition of the Talks tells us: I am often asked if you were stranded on a desert island and had only one book what would it be? 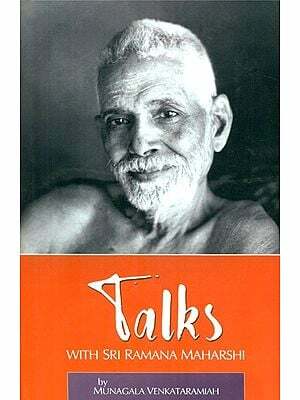 This book he chose was “Talk with Sri Ramana Maharshi but added he would take one or two more along with Talks. I think it is not far from truth so say Ramamohan pointers to self Realization who would refused to accept the graciously offered compass and a compact map to the profound Arunachala Bhagavan landscape of Self-Enquiry? I happened to see Bhagavan Sri Ramana Maharshi Photo at my niece marriage in the year 1996. I did not know who he was at that time. I wondered why people in the marriage party were worshipping him like God. The answer came to me soon enough! 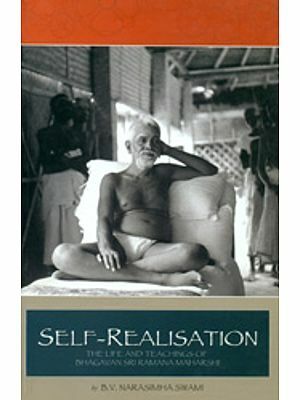 In the year 1999 or 2000 my father in law presented me a copy Self Realisation by Sri Ramana Maharshi. I happened to read it after some months, probably in the year 2000. It is a beautiful and inspiring biography. The great teachings given to Humphreys and the experience of Paul Brunton quoted in the book made it riveting. From his conduct His answers to the questions of the early devotees and his techniques I felt that he was truly Bhagavan. When I completed reading the book I was stunned into silence. I felt that the path shown by him is the only one worth treading in this life and success is bound to follow if a genuine attempt is made. Paul Brunton a foreigner to our culture and ways was a grand example before me. I did not have the slightest feeling that Sri Bhagavan was not present. I felt that the power of His presence is there to guide me. The book inspired me so much that I felt I must at once start practicing self enquiry. I obtained a copy of the book who am I Soon. At that time I was busy with a big project in Saudi Arabia with a 12 hour daily work schedule. Yet I managed to Practice self enquiry earnestly with them firm faith that Sri Bhagavan grace and guidance will be with me. In a few months the practice resulted in a three and half hour thought free state in which there was perfect awareness without even a single thought. In fact during that period I could not raise even a single thought. In utter silence I sat down in may chair for a long time and might have moved a bit in between to attend to something but in a thought free state. The vision associate with paul Brunton experience was not there but it was a state of perfect awareness and utter peace. I quit my job returned to Hyderabad in 2001 at the age of 54 with the intention of putting to practice Sri Bhagavan teaching I visited Sri Ramanasraman around November 2001 for the first time and enjoyed the vibrant presence of Bhagavan Sri Ramana. I am very grateful to the president and the authorities of Sri Ramanasramam for the kindness bestowed on me. They continue to bestow the same kindness on my family and me every time we visit the Ashram. 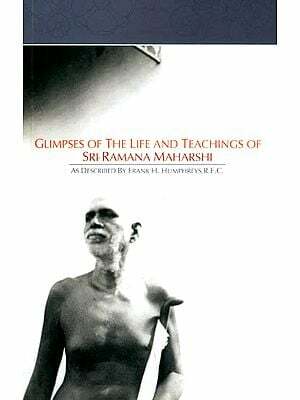 Considered the fact that Sri Bhagavan preferred method of teaching was through silence we are fortunate to have the wonderfully works of talks with Sri Ramana Maharshi Day by Day with Bhagavan and Ramanaasrama Lekhalu and must be eternally grateful to their recorders. 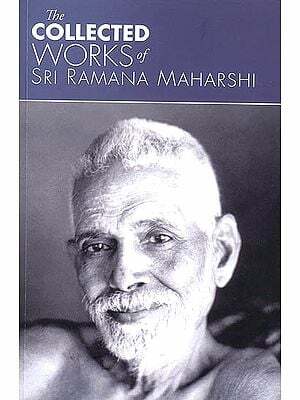 The one book which had the greatest impact on me was Talks with Sri Ramana Maharshi by Sri M. Venkataramaiah. I read and reread it. 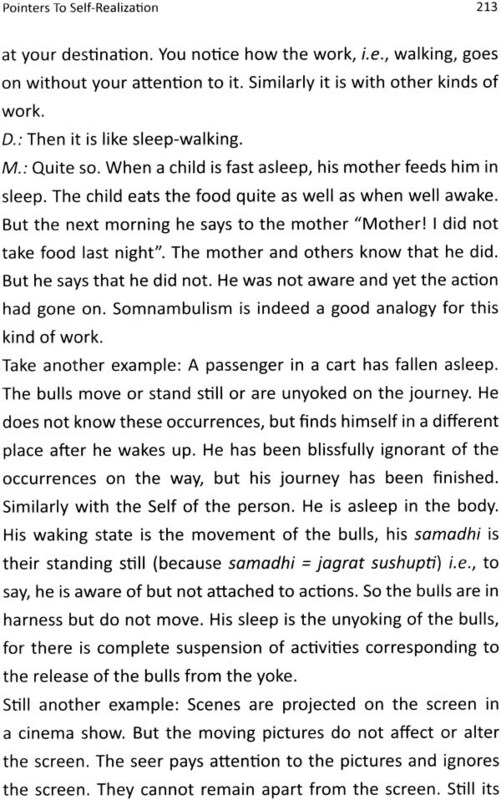 Sri Bhagavan teachings on sleep stats appeared to be the key to unlock the mystery of I. I began to delve into his teaching on consciousness in dream sleep and waking on ego and work etc. in some places I made some explanatory notes for myself on the above topics and on the transition from sleep to waking emergence of mind, its subsidence etc. in my notes I tried to highlight all puzzling questions of devotees and tried to understand Sri Bhagavan replies. Over a period of the past 6 to 8 years the notes appeared to arrange themselves in an order and the main contents took the form of the last 3 parts of this book. Sri Bhagavan teachings are unique in the sense they repeatedly draw our attention to our I the questioner and the doubter. He teaches us to look at our I in relation to our own day to day experiences in sleep, dream and waking. We may have just looked at sleep as a necessary event for our body rest. We may be surprised that we have not looked at it as a pointer to our real states of unalloyed happiness and brushed it aside as unimportant spiritually. Now a few words about the structure of the book and its contents. The states of self realization is the state of supreme silence that cannot be scribed. At best one may point to the way to attain it. So the book is named pointer to self Realization. Titles given to the selected talk are intended to serve as pointers to some extent. It must be noted that the import of the title may not be covered in full by that particular talk; it may well be scattered in a number of talks. The book has four parts. They all have 1) and introduction that tries to provides and understanding of Sri Bhagavan teachings relevant to the title of that part (as understood by me), 2) selected talks with Sri Bhagavan that pertain to the theme of that part. In the talks possible extent so that they may help the reader to understand the context of talks and Sri Bhagavan replies better. It may be pointed extent so that they may help the reader to understand the context of talks and Sri Bhagavan replies better. It may be pointed out that the talks selected where responses of Sri Bhagavan to the specific question of devotees from varying background. So teachings from a number of talks are pieced together and presented in the introduction as a theme. Some a concepts is repeated so as to maintain the continuity of the argument. While going through the selected talks the reader will have to carefully pick up the thread of continuity from various talks to arrive at the relevant conclusion as the information is scattered. For example various bits of information in various talks will have to be pieced together to understand the deep sleep state and appreciated its importance in Sri Bhagavan teaching fully well. Every sentence of Sri Bhagavan is illuminating and very powerful. Yet I ventured to selected a few sentence of Sri Bhagvan and of the devotee from the selected talks and present them in bold text so as to draw the attention of the reader. The reader may find some other sentence of Sri Bhagavan to be more revealing. The first part deals with man’s quest for absolute and permanent happiness the source of which is his own self. Sri Bhagavan brings about this truth in a telling way. Most of the time man way of seeking peace/happiness is through ending suffering of fulfilling a wish s a piece meal attempt shuttling between misery and happiness instead of finding the fountain of permanent happiness with in him. The second part deals with providing an understanding of the self, peaceful as in sleep but conscious as in waking underlying both states and the need to consciously experience it as the path to Realization. The third part deals with the arising of the wakeful entity that we call I upon substratum of the self. It tells us how we mistake ourselves to be individuals. It tells us that in the waking state there is only consciousness shining like sun as substratum, and the reflected consciousness pervading the body mind like sunlight. It tells us that if we get hold of the consciousness that pervades the body mind the I am ness it will take us to the self. In the end we realize that sun and sunlight are one. We experience conflict in our day to day activities. So I felt that Sri Bhagavan teachings on action work and doership which guide us in the practice of surrender should form the fourth part of the book. Sri Bhagavan says that there is no individual in us at all. We have the freedom t identify with the self but we identity with the body. Sri Bhagavan says taht the actions performed by our bodies are not ours but we identify with them and go through sorrow and joy. This implies that no one has any control over the events that take place. This understanding paves way for acceptance of the events as we face them and a total surrender that enables us to lead a peaceful life in the face of its provocations and challenges. 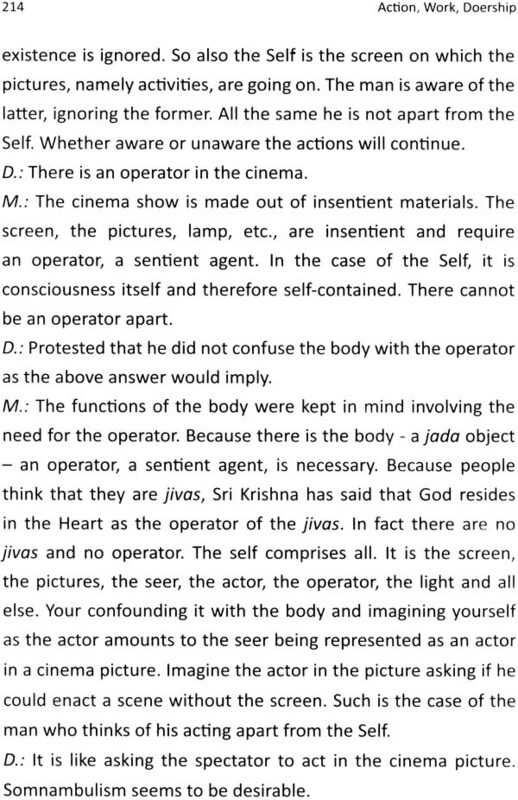 While reading that the talks Sri Bhagavan makes such statements as the self is all. Now I ask you: Are you apart from the self? Can the work go on apart from the self? Or is the body apart from the self? None of them could be apart from the self; if we read the word self as consciousness the sentence makes full meaning because everyone knows that the he cannot be and cannot function without consciousness. My grateful tanks are to Sri K.V. Subrahmonyan a resident of Sri Ramanasraman Prof. M. Sivaramkrishna, Dr. S. Upendran Sri V. Krithivasan and Sri N.A. Mohan Rao for painstakingly going through the manuscript and for their very valuable suggestion and contributions in presenting the book in its present form. I thank Sri P. Keshava Reddy Sri Pulizala Rahavender, Sri A.V. Ramanaih Sri J. Yadaiah, Prof. Laxmi Narain, Sri K. Ramakrishnarao, Sri Tadimeti Satyanarayana, Sri Donepudi Venkaiah, Sri V. Ramadas Murthy and Sri G. Sri Hari Rao for their Valuable Suggestions in bringing out this book. My grateful thanks due to the president of Sri Ramanasramam, Sri V.S. Ramana for giving the permission to publish the book and to Sri V.S. Mani for his encouragement. My thanks are to my wife padma, my main stsang partner, and my children shilpa and Sashank with whom too I shared my notes and had beautiful satsangs. I would like to express my gratitude to my loving parents Smt Saraswathi and late Sri sethumadhavarao to my uncle Late Sri Bhavaraju Acharya Padhni and aunt Jayaprada who took care of me and my family after my father demise and taught me to be patient and accept the life situation as it unfolds t my parents in law Smt. Meenakshi and Sri. T. Chennakesavarao who introduced me to Sri Bhagavan and to Sri Jinuuru Nannagaru whose love and blessing my family and I have always cherished. My thanks are due to M/s Karshak Art Printers and M/s G.V. Graphics for their kind cooperation and a job well done. I am very grateful to Sri Rmana Kendram Hyderabad for agreeing to bring out this compilation in a book form. 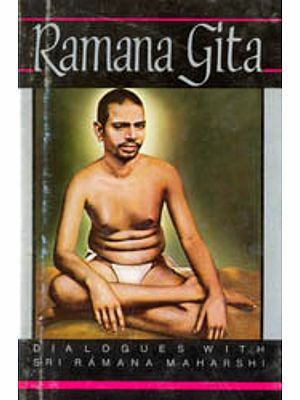 Just as jiggery is pinched from lord Ganesa’s statue and offered back to him this book containing the essence of Bhagawan teachings in a humble offering to the Lord Bhagavan Sri Ramana. Sri Bhagavan says that everyone is the self by one’s own experience. It is the intent of this book to bring about this truth through the teachings of Sri Bhagavan. The first part deals with the bliss aspect of the self; how and why man pursues happiness in the world the nature of happiness he pursues; the consequence of his pursuit the real nature of happiness, and where to look for it. Every person wants to be happy all the time. He likes to be with people who make him happy and likes to surround himself with objects that give him happiness. He recalls events from his past that give him happiness and plans for future events that are likely to bring him happiness. He avoids painful memories avoids people and objects that are associated with painful memories. When there is pain he looks for relief. Thus man is single minded in his pursuit of happiness; he avoids pain and suffering at all cost. Happiness forms the motive for all the actions of man. His actions for the attainment of happiness are tow fold. One is oriented towards his physical well-being. In pursuit of happiness man looks after the needs of the body such as satiation of hunger, thirst, rest, sleep, exercise, etc. He would like to avoid or remedy anything that comes in the way of his physical well-being. The second is oriented to psychology well-being. During the course of his life, man gathers impressions of people, events, objects, circumstances that have given him happy or unhappy experience. These impressions are stored in his memory and form the basis for his behaviour in all his future actions. In the light of the experiences gained he tends to judge everything that he comes across in his day to day life. He will do everything that will make him happy and avoid those things that are likely to cause him unhappiness. Even if he succeeds in gaining happiness in a situation it is short lived because either such happiness in a situations it is short lived because either such happiness soon turn into pain or he encounters another situation. Instead of success, he may encounter failure and face pain, fear, distress, anger, etc. He desperately tries to come out of them. In the process he gather fresh impression that form the new basis for future judgements. Without his knowledge he gets into an endless cycle of impressions, judgments action and experiences of pleasure and pain. Thus from one moment to the next man strives for continuous uninterrupted biological and psychological happiness. Even when he thinks that he is doing something for the happiness of others beneath it lies his urge to derive personal happiness. In acts that appear to be sinful or inhuman too he is motivated by his urge to be happy of rear of loss of happiness. 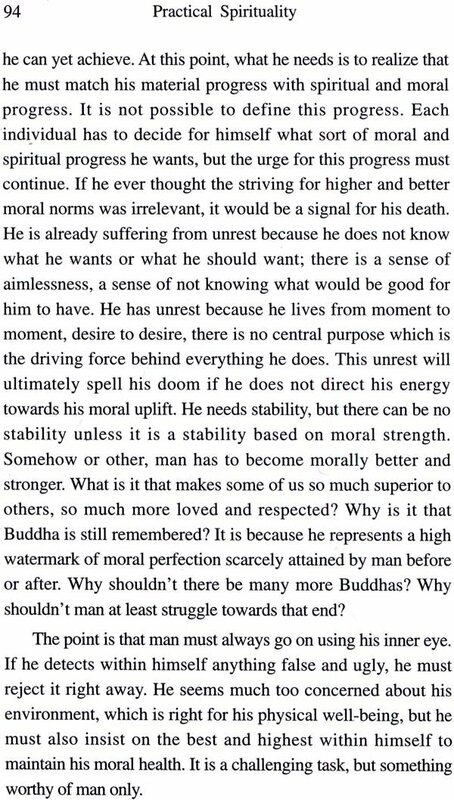 Where does a man look for enduring happiness? It is common for an individual to compare himself with others. After careful consideration he often mistakenly concludes that his happiness is limited because he does not possess something that other have. He begins to acquire one object after another. He does not realize that even acquisition of an empire does not give him unlimited pure and permanent happiness. In the process of acquiring objects for fulfilment he acquires not happiness, but passions such as kama (lust), krodha (anger), etc., passions that cause unrest and suffering in him. Even though for most part of his life man searches for enduring happiness in the world outside and fails rarely does he consider looking for it within. Bhagavan Sri Ramana Maharshi syas that such happiness man pursues may be better described as pleasure. It is so because hidden behind such source of pleasure is its opposite too pain. When one buys a new car, one feel happy. But when it gets first scratch or dent, the owner feels pain. When someone has a sweet tooth buying and eating a few sweets may give him pleasure. But if he eats whole of them he may get a stomachache or may vomit. We may say that pain and pleasure form a package deal; the two go together. When we obtain object we buy a package of pleasure and pain. At some time or the other the source of pleasure yields pain. Real happiness is not a bundle of opposites; it does not carry an opposite hidden beneath it. Such unadulterated happiness is described as bliss or peace. 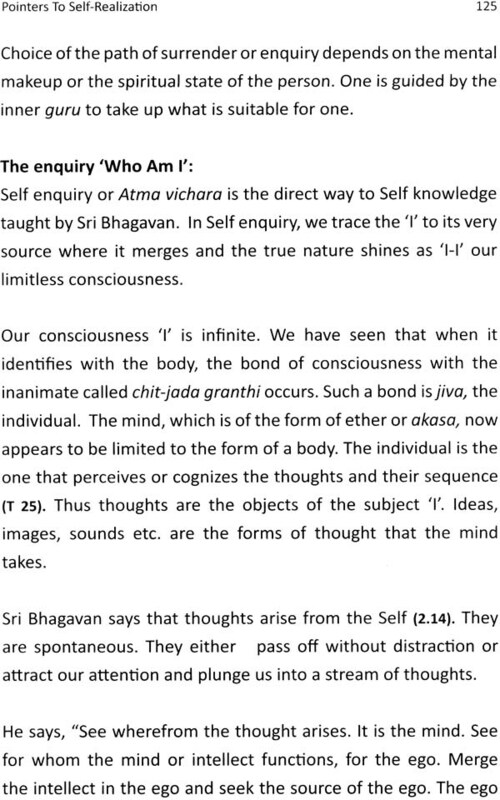 Bhagavan Sri Ramana Maharshi in the introduction to who am I? Point out that every being desires absolute and permanent happiness. He brings out a simple but extraordinary truth behind this behaviour of man. We have seen that man likes to have things that make him happy. He thinks that he loves the objects but his love for them stems from underlying feeling that they give him happiness. His love for his wife and children too stems from the feeling that they give him happiness. Of all the things he likes or loves he loves himself the most. But man does not realize that behind the love he had for himself is the hidden truth that his own inherent nature is happiness. All his actions are oriented to seeking what is natural to him. Sri Bhagavan points to the fact that man experiences happiness in deep sleep when the mind which he believes is the instrument with which he can search for happiness is not there. I deep sleep, he is present as pure self without any limitation. To experience the same kind of happiness in the waking state he should find that which has given him happiness in sleep and experience it in the waking state as well. That is he should consciously experience the self in the waking state. Sri bhagavan sys the inquiry who am I?’ is the principal means for gaining this experience which is known as self knowledge. If man inherent nature is happiness how did he lose it? Sri Bhagavan says that the main source of man’s problems is the mistaken notion that he is the body. The idea that he is a limited person and that acquisition of objects makes him complete and happy has driven man to look or it n the outside world. Even though the whole universe is him by limiting himself to the body he is reducing himself to a mere speck in the universe. We are the self perfect peace by nature. But as we limit ourselves to the body our perfection is clouded. As we grow from a baby to an adult at some stage the I am the body feeling takes root and grows stronger. Pure unattached, unlimited consciousness of a baby appears to gradually get attached to the body. The sentience appears to get mixed up with insentience. The child begins to say I referring to the body. This Sri Bhagavan calls the I thought. An egoic, limited entity that we call I made up of impressions of name form experience based on knowledge acquired through senses taken form. This is not the real I the Consciousness but a thought that is at the root of all the activities of this egoic entity I. It is the false self. The ego has two component. One is the conscious or sentient aspect that is in reality infinite but now limited; and the other, the insentient aspect the body. As the I thought takes hold of us, grips us and pushes us to regain that completeness or perfection by getting something or doing something. In process the ego instead of transcending the self imposed limitation of I am the body thought gets deeply rooted in it. In search of completeness our I want to have more things which it can call mine. As a baby grows we can see how its mine feeling the felling of possessiveness begins to take shape and develop. During this stage, the baby begins to recognize and object as its source of happiness. At some stage in life one may say I am complete now that I have a good family a house a car investments a job salary etc. One may proudly say I am so and so and be very happy with one identity. One activities may appear to be successful and may give the feeling of completeness fulfilment and momentary satisfaction. However after a while the circumstances change this kind of happiness dependent on external objects (pain as opposed to pleasure) surfaces sooner or later. The happy image one has identified with diminish or even dissolve. The same person the proud I am so and so who felt happy about his achievement feels unhappy now. Therefore to regain completeness and happiness another activity cycle begins. It is an endless cycle. Possessions and achievement play on our egoic sense. As their value in our mind increases or decreases we go through happiness or unhappiness. When their value becomes zero a person may think that he is worthless and may even be driven to suicide. The unhappiness may be of such severe intensity. His ego leads him to believe that since the value of his possessions has diminished he too has become worthless. Can a person ever lose the source of his happiness? The same person who feels worthless because he has no possessions feels happy when he is sound asleep. He thus has two state one of happiness in sleep when there is no mind and I thought and the other of unhappiness in waking when there is mind and I thought. It is the I thought the false self which causes all the trouble that makes him thin that he is limited and his source of happiness lies in external objects. Mercifully as the sleep state shows, the source of his happiness is till very much there in him. It has not as deserted him as he believes. Irrespective of what he thinks the outside world with its unlimited objects is not the source of happiness. In a baby in whom the I thought has not taken hold this misery is not felt. Since the baby has no concept of possession it is in a blissful state that is not dependent on outside objects for its happiness. If the assumption that happiness lies in external causes or objects is true happiness must increase with the accumulation of one possessions and diminish with their decrease. If an individual has possessions and diminish with their decrease. If an individual has no possessions his happiness too must be nil. Sri Bhagavan points out that this assumption is not supported by one experience. In deep sleep an individual has no possessions; he is not even aware of his body or mind, yet he is quite happy. Irrespective of the variety and intensity of problems one has faced in one’s walking state, everyone experience the same peace in deep sleep. Sri Bhagavan point to the fact that the source of happiness in man is not external objects and circumstances are not permanent so is the happiness dependent on them. It is not worth therefore seeking them out or running after them. 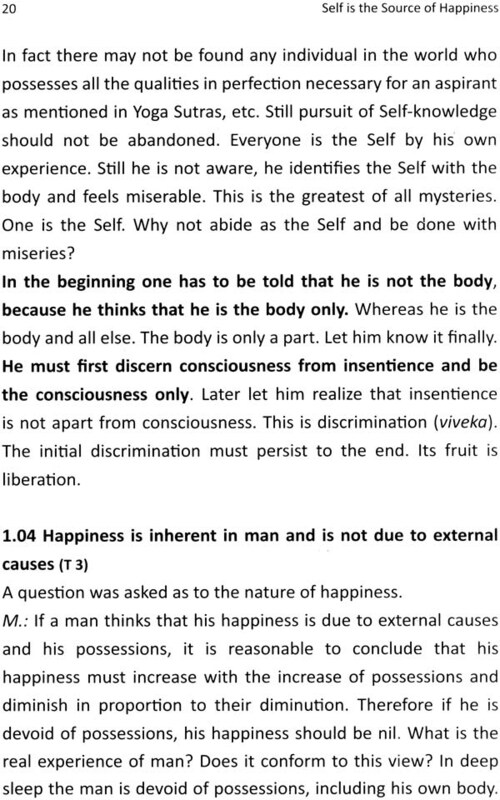 In conclusion, Sri Bhagavan syas that happiness is inherent in man it is not gained anew but just rediscovered. To discover this source of happiness in oneself one must realize the self the storehouse of happiness in oneself one must realize the self the storehouse of unalloyed happiness and perfect bliss or peace. The happiness of the self being inherent and independent of external causes it is absolute and permanent. Thus when a man discover the Self he gains absolute and permanent happiness. No one can ever lose the self. Sri Bhagavan says that the passions Kama (lust), Krodha (anger), etc., arise because of likes and dislike towards the objects seen. How do the objects get the power to cause a disturbance in our inherently peaceful nature and make us unhappy or happy? How does the same object be the cause of both happiness we believe that our happiness lies in possessing or avoiding in us because we believe that our happiness les in possessing or avoiding them; having forgotten that self the source of infinite happiness. Forgetting one being is avidya, i.e. ignorance in this case the ignorance of the self. Our desire for an object creates a disturbance in our naturally peaceful state. It subsides when the desired object is obtained restored in the happiness inherent in us being temporarily restored. We feel happy again but we mistakenly believe that the possession of the object has given us happiness. Though the real source of happiness is within us we seek it elsewhere. Sri Bhagavan says that if we stop seeking bits and pieces of pleasure peace we will enjoy the state of permanent happiness. When we pursue our desires we become passionate and all passions are accompanied by irregular breathing. Outbursts of joy when we accomplish something and bouts of pain when we fail are both accompanied by erratic breathing. When we experience real happiness that is when we experience peace the breathing is slow and regular. So peace is real happiness. Pleasures do not constitute happiness. The inherent nature of the self is the peace or happiness of the kind that we experience in deep sleep. It is a state of bliss which is permanent; a neutral state without an opposite hidden beneath it. It can never be subject to the pairs of opposites. Thus if we find the self and abide there in there will be no trouble caused by passions. The cause of the passions is the desire to be happy or enjoy pleasure. The desire for happiness arises because our nature is happiness is not found anywhere else except in the self. Therefore Sri Bhagavan asks us not to look for it elsewhere but seek it the self and abide therein. Sri Bhagavan says that suffering is not a natural state. He asks if suffering be the natural state how can the desire to be happy arise at all? The desire to be happy arise in every one. Even a emperor seeks happiness. He may be healthy enjoy great comforts food services but he may be having endless troubles and suffering. Who is the sufferer? 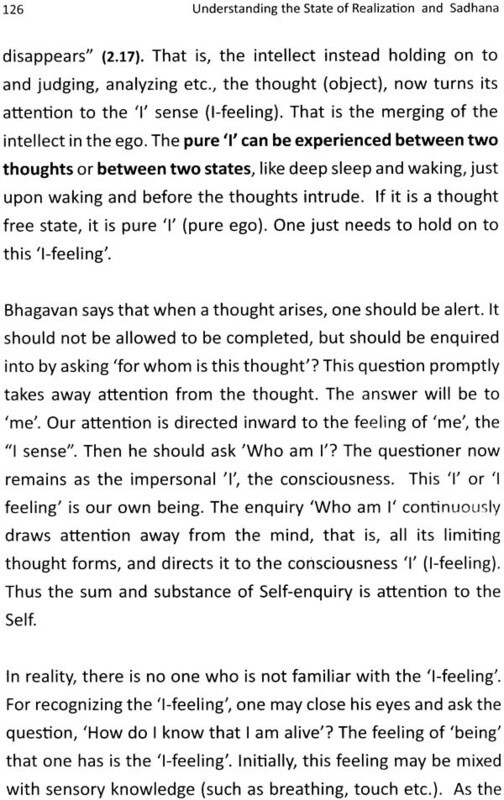 Sri Bhagavan says that the sufferer is an imagined entity called ego, which is neither the body mind nor the pure self. Upon inquiry this spurious entity disappears leaving the substratum the pure I the self. Then we will know that the pure I is self it is the only eternal being and eternal bliss. We are the self in sleep. We are the same now. We need to realize that we are the same self in both the waking and sleep states. How happy we were before the rising of the ego! The rising of the ego and limiting ourselves to the body are the causes of the present trouble. Sri Bhagavan says, trace the ego to its source and reach that permanent happy state which is sleepless sleep. The self remains ever the same. There is nothing else to be gained. Happiness is born of peace that is natural to the self. Peace can reign only when there is no disturbance. Disturbance is due to thoughts that arise in the mind. When the mind itself is absent there will be peace. So unless a person has annihilated his mind he cannot bestow happiness on other. A realized person has no mind; there is no ego in him. He is not aware of anyone as separate from him. He is established in perfect bliss and whoever sits in his presence experiences the same peace. 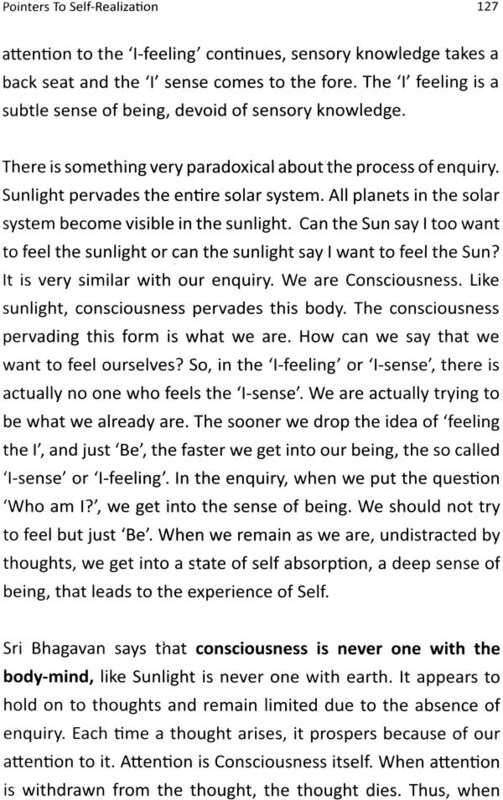 So Sri Bhagavan says that the force of one’s self realization is far more powerful than the use of all other powers. So the self is the source of happiness in all beings. Whenever the self is veiled by the mind as thought the peace natural to the self seems to be lost. Again whenever thought subsides man experience peace. All attempts of man to be happy are his unconscious attempts to regain the self. The one who recognizes this truth unwaveringly sets on the path of self-knowledge. The next section present selected talks of Sri Bhagavan which pertain to what has been presented in this section.